Forgot about candy, flowers and jewelry, although those are all good options. If you really want to show your love, pop open a bottle of bubbly. Nothing says romance quite like Champagne or sparkling wine. 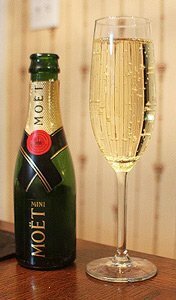 Look for individual-sized bottles, what the Moët & Chandon company calls a mini. We had two of these 187-ml bottles filled with Moët Imperial Brut, and they were perfect for my wife and I. Like most Champagnes it is a blend of three grapes: pinot noir, pinot meunier and chardonnay. The blend changes slightly over time, but the range is 30-40 percent pinot noir for body, 30-40 percent pinot meunier for suppleness and 20-30 percent chardonnay for finesse. The blend is created from more than 100 different wines, of which 20-30 percent are reserve wines to add complexity, maturity and constancy. Over the years the style has remained the same, focusing on bright fruitiness and seductive palate. It is a wine you can drink all night without getting an acid taste in your mouth. It seems people around the world are discovering the delights of sparkling wine. Worldwide consumption has grown by around 40 percent in 10 years, faster than the growth of still wines. In the United States sales of sparkling wine nearly doubled from 2005 to 2016 and sales of foreign sparkling wines nearly tripled. In 1833, the company was renamed Moët et Chandon after Pierre-Gabriel Chandon de Briailles, Remy Moët’s son-in-law, joined the company as a partner of Jean-Remy Moët, Claude Moët’s grandson. Moët vineyards total 2,840 acres in rich chalk soil, 50 percent of which are grand cru and 25 percent premiers cru, the largest vineyard area in Champagne. Underground, the Moët & Chandon cellars are the most extensive in the region, extending more than 17 miles. Combining tradition with new technology, the company continues to innovate, using the latest advances in sustainable farming. 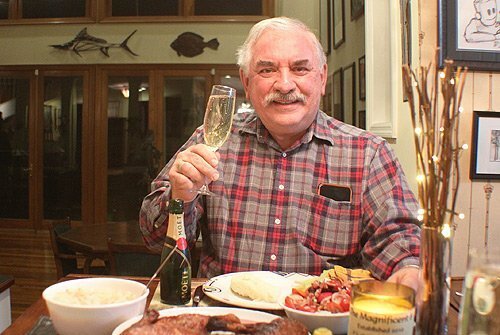 Champagne makes every meal feel festive.